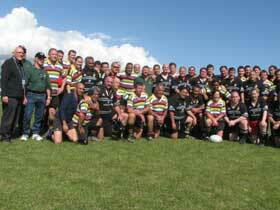 The Parliamentary Rugby team turned out during the Golden Oldies Rugby tournament in Wellington on Wednesday 2nd November. We played the Centarians, a team of mixed Wellington players and special guests Frank Bunce and a couple of Silver Ferns! 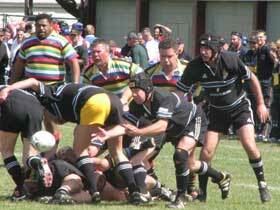 We went down but acquitted ourselves well. 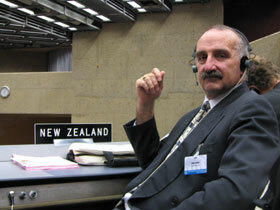 In October 2006, as Permanent Head of Delegation, I was privileged to attend another session of the Inter-Parliamentary Union in Geneva. 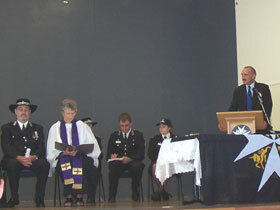 You can read about the proceedings here. National Spokesperson for Education Mr Bill English joined me in a visit to Kerikeri High School where we took the opportunity to talk to students and teachers, see classes in action, review the Development Plan and ask about school key initiatives. 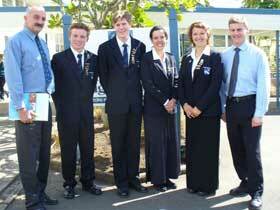 Here we are with KHS’s Head and Deputy Prefects. 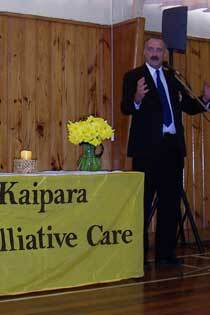 On Sunday (13 Aug) I attended a fund-raising lunch at Ruawai to benefit the Kaipara Palliative Care. My colleague Lockwood Smith (another Ruawai old boy) drew the raffles and I auctioned some lovely Rosemary plants (the flower of remembrance). The day raised about $2,000 for KPC. 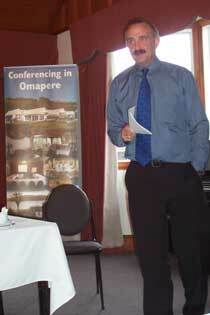 We had a great National party meeting at Omapere last Saturday (12 Aug). After working through Electorate matters, I addressed the meeting on my feelings on rights and responsibilities. You can read it here. 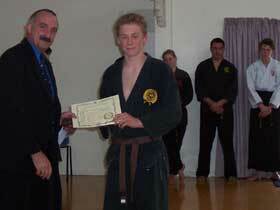 I attended the award presentations, held at the Whatuwhiwhi Community Hall, of the Sei Shin Ryu Karate Club. What a marvelous exhibition of skill, strength and discipline! 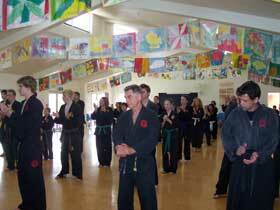 Many students received certificates and some achieved the next Belt. I was very impressed with the commitment and effort of Sensei Ian Sharples in establishing and maintaining his dojo. My colleague Sandra Goudie invited myself and Mark Blumsky to her home patch as “celebrity” guests at the annual Matatoki School “Possum Bust”. 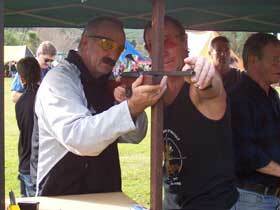 The aim is to make a concerted effort to control these pests and have a bit of fun, and raise funds for the School. 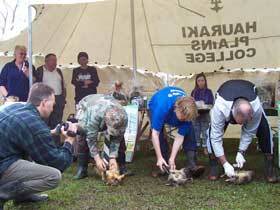 There was possum-skinning, gumboot throwing and target shooting. “Ken” even showed up to film a segment for his upcoming show. 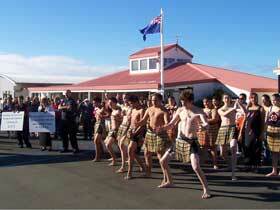 The day was a great success and raised around $8,000 for the School. 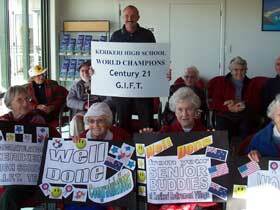 I was among an excited crowd that welcomed the Kerikeri High School problem solving team home from their successful competition in the USA. 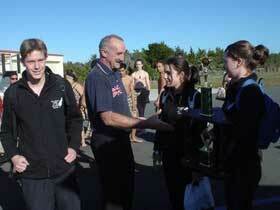 These young people are a credit to their community and to Northland. 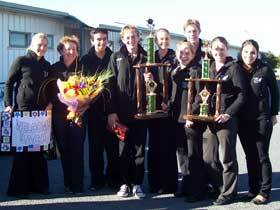 I was reminded of another successful problem-solving team, from Kaitaia, back in 1994. These wins are not just a ‘flash in the pan’; its pattern of success that bodes well for our future. 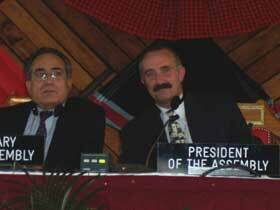 As one of 3 NZ representatives to the International Parliamentary Union (IPU), I went to the 114th Session in Nairobi, Kenya in May 2006. 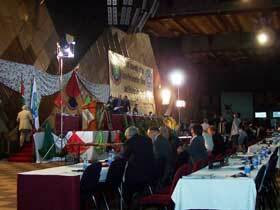 I was elected as President of the Assembly for one of the plenary sessions. I was amazed at the vibrancy of this developing nation, but also touched by the poverty I saw there. I have to say, in NZ, to quote a well-known phrase "we don’t know how lucky we are". At an induction ceremony for young St John recruits, I was impressed by the number of our youth who are making a commitment to their communities. 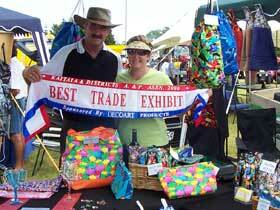 I had the pleasure of officially opening the 2006 Kaitaia A&P Show and judging the best trade displays. 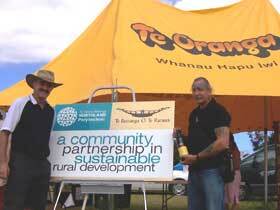 The winning stall had a great display of colour and the second place entry told a positive story of sustainable development in small rural areas. 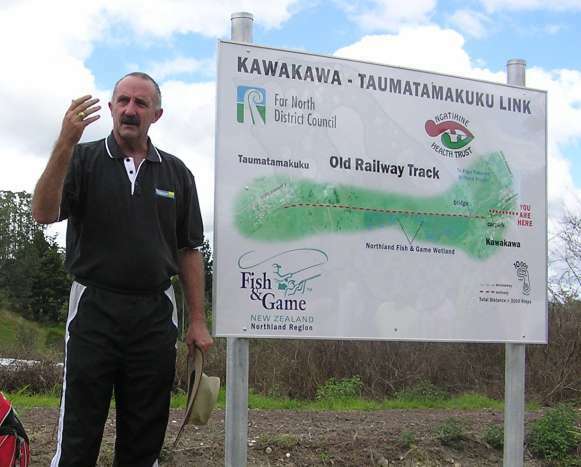 I attended the opening of a new access track and wetlands at Kawakawa; a cooperative project by Northland Fish & Game, the FNDC and Ngati Hine Health Trust. I was so impressed by the gracious and welcoming attitude of Taumatamakuku locals, expressed so eloquently by their kaumatua, Toko Tipene. 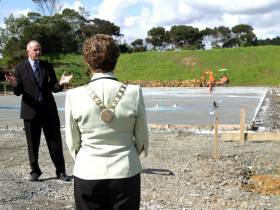 I had the pleasure of being present to mark the laying of the floor of the new Doubtless Bay Christian Centre (formerly the Doubtless Bay Baptist Church). Its great to see good works such as this one making progress, having overcome the many obstacles. 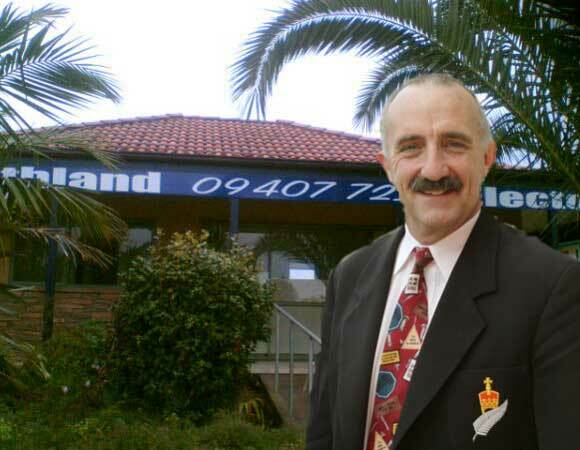 My electorate runs from coast to coast across the mid- and far- north and from just north of Te Hana to the Cape. Seeing my constituents means spending a lot of time behind the wheel!